Cardiac resynchronization therapy (CRT) is a new treatment for refractory heart failure. However, most heart failure patients treated with CRT are middle-aged or old patients with idiopathic or ischemic dilated cardiomyopathy. We treated a 17 year 11 month old girl with dilated cardiomyopathy after mitral valve replacement (MVR) and septal anterior ventricular exclusion (SAVE). Seven years after the SAVE procedure, she presented complaining of palpitations and general fatigue with normal activity. Her echocardiogram showed reduced left ventricular function. Despite of optimal medical therapy, her left ventricular function continued to decline and she experienced regular arrhythmias such as premature ventricular contractions. We thus elected to perform cardiac resynchronization therapy with defibrillator (CRT-D). After CRT-D, her clinical symptoms improved dramatically and left ventricular ejection fraction (LVEF) improved from 31.2% to 51.3% as assessed by echocardiogram. Serum BNP levels decreased from 448.2 to 213.6 pg/ml. On ECG, arrhythmias were remarkably reduced and QRS duration was shortened from 174 to 152 msec. In conclusion, CRT-D is an effective therapeutic option for adolescent patients with refractory heart failure after left ventricular volume reduction surgery. Left ventricular volume reduction therapy has been an effective treatment modality for end-staged dilated cardiomyopathy. Some patients, however, suddenly worsen due to leading to heart failure. To address asynchrony, cardiac resynchronization therapy (CRT) was developed and is recommended by the AHA 2009 guidelines . More than 4000 heart failure patients with ventricular asynchrony have been evaluated in randomized controlled trials of optimal medical therapy alone versus optimal medical therapy plus CRT. CRT has resulted in significant improvements in the quality of life, functional class, exercise tolerance, and ejection fraction [2–5] in patients with refractory heart failure. But most patients are middle-aged and older adults with ischemic heart disease. Moreover, there are no guidelines for pediatric patients. Here we report the successful use of CRT in an adolescent girl after septal anterior ventricular exclusion (SAVE) procedure during childhood. In December 2009, a 17 year, 11 month old adolescent girl with history of worsening dilated cardiomyopathy after mitral valve replacement (MVR) and septal anterior ventricular exclusion (SAVE) was admitted to our hospital for the evaluation for cardiac resynchronization therapy (CRT). At two months of age, a heart murmur was noted on examination and one year later, she was diagnosed with congenital mitral valve stenosis (MS) and mitral valve regurgitation (MR). Despite optimal medical therapy (digitoxin and diuretics), her left ventricular end-diastolic diameter (LVDd) gradually increased and her MR worsened. She underwent MVR at age six, but the cardiac function deteriorated and LVDd progressively increased. At age 11 years and 1 month, she went into a cardiogenic shock and emergently underwent SAVE and a second MVR procedure emergently. She successfully recovered from cardiogenic shock and the physical activity improved from New York Heart Association (NYHA) class IV to class II . Her cardiac function has remained stable for six years following the SAVE procedure. In June 2008, six years after the SAVE and second MVR procedures, she developed palpitations and general fatigue with regular activity. The LVDd was again dilated, and the left ventricular ejection fraction (LVEF) decreased. In the course of six months prior to her hospitalization, the serum BNP increased from 148.6 pg/ml to 493.1 pg/ml. In addition, QRS duration suddenly widened from 126 msec to 182 msec. Tissue doppler echocardiogram confirmed a clear asynchrony. We recommended CRT placement given her worsening heart failure following left ventricular volume reduction therapy. At the time of admission, her body weight and height was 33.0 kg and 143.0 cm. The chest X-ray revealed significant increases in cardio-thoracic ratio (CTR) (70.6%) and pulmonary congestion. Echocardiogram showed LVDd of 59.3 mm (134.2% of normal), and reduced LVEF. LVEF was also measured by a cardiac MRI, and was estimated to be 23.7%. Serum BNP was again elevated at 448.4 pg/ml. 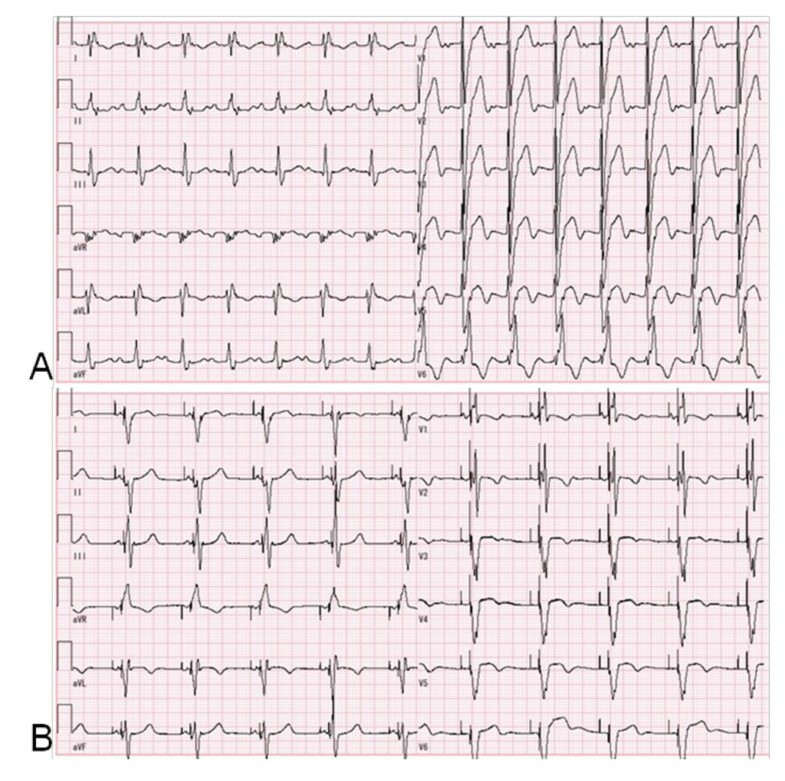 Her ECG showed widened QRS duration of 174 msec and complete left bundle branch block (CLBBB) (Figure 1A). We concluded that cardiac asynchrony was probably responsible for her worsening heart failure. She was immediately scheduled for CRT placement. ECG before and after the CRT placement. Before the CRT placement (A), QRS duration was prolonged as 174 msec. In addition, ECG showed the prolonged PR interval and complete left bundle branch block (CLBBB). After the CRT placement (B), the QRS duration was shortened to 152 msec. In addition, PR interval was shortened and CLBBB changed to complete right bundle branch block (CRBBB). On the third day of hospitalization, CRT with defibrillator (CRT-D) implantation was performed by transvenous approach. We chose CRT-D, Medtronic Concerto C154DWK, because she experienced arrhythmias such as premature ventricular contractions (PVC), non-sustained ventricular tachycardia and atrial flutter. Before the CRT implantation, we assessed asynchrony by tissue doppler echocardiogram and determined the most delayed site of the whole wall movement. We targeted the most delayed site as the optimal pacing site. But the strong degeneration of cardiac muscles restricted the possible pacing site. We placed an atrial lead at the right appendage and a RV lead at the apex. A LV lead was placed at the lateral wall of the coronary sinus because there was the possibility that the main trunk of the coronary sinus was occluded during the SAVE procedure assessed by contrast medium. We show the final pacing site by the chest X-ray (Figure 2). The pacemaker mode was DDD 60-130 bpm biventricular pacing. While testing the implantable cardioverter-defibrillator (ICD), a 10 J defibrillation was administered for ventricular fibrillation. All segmental max delay and all segmental standard deviation improved from 140 msec to 86 msec and 44 msec to 26 msec, respectively, by tissue doppler echocardiogram. Three months after the CRT-D implantation, the LVEF improved from 31.2% to 51.3% (Figure 3) and the serum BNP levels decreased from 448.2 to 213.6 pg/ml. The QRS duration was shortened from 174 to 152 msec (Figure 1B), and arrhythmias were extremely reduced. By a Holter monitoring, the number of PVCs reduced from 3625 to 127 and double-barreled PVCs reduced from 101 to 1 per 24 hours. The physical activity improved remarkably and the NYHA classification improved from class III to class II for around one year. She was able to resume her previous level of activity. 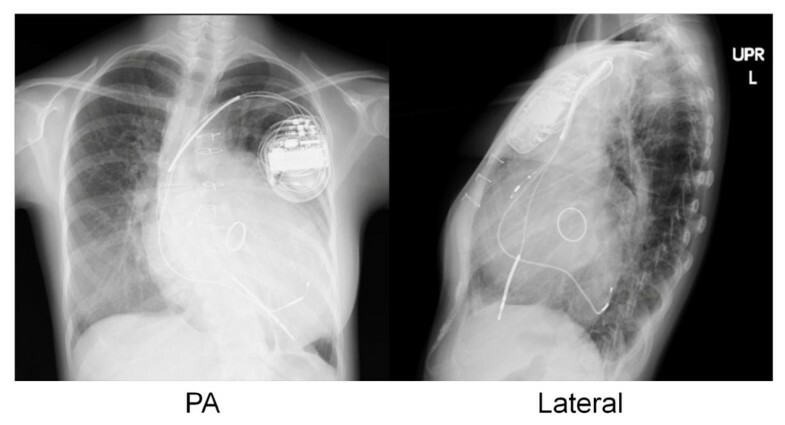 The chest X-ray (PA and Lateral projection) after the CRT placement. 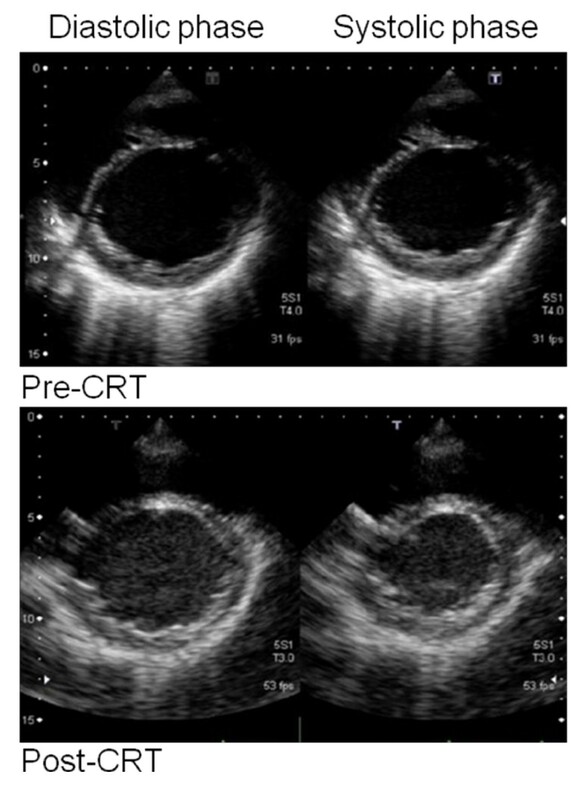 Echocardiogram before and after the CRT placement. Each panel shows the short axis view of the LV cavity. Upper panels: The LVDd was 59.3 mm and LVEF was 31.2% before the CRT placement. Lower panels: The LVDd was 61.3 mm and LVEF was 51.3% after the CRT placement. CRT has become an accepted method for treating refractory heart failure in patients with idiopathic or ischemic dilated cardiomyopathy associated with electromechanical asynchrony. In the current AHA guidelines, CRT is a class I (level of evidence A) therapy for patients with a LVEF less than or equal to 35% and a QRS duration greater than or equal to 120 msec who are symptomatic (NYHA functional Class III or IV) despite optimal recommended medical therapy . At the time of our patient's admission, she meets all these criteria despite optimal medical therapy. We thus thought that she was an appropriate candidate for CRT. CRT may be performed with or without defibrillator. In the CARE-HF (Cardiac Resynchronization in Heart Failure) trial, a randomized controlled trial comparing optimal medical therapy alone with optimal medical therapy plus CRT without a defibrillator, CRT significantly reduced the combined risk of death of any cause or unplanned hospital admission for major cardiovascular events (analyzed as time to first event) by 37% . In the COMPANION (Comparison of Medical Therapy, Pacing, and Defibrillation in Heart Failure) trial, directly compared pacing with CRT-D and CRT without defibrillation with optimal medical therapy, only CRT-D reduced sudden cardiac death (SCD) [9, 10]. Although there was insufficient evidence to conclude that CRT alone was inferior to CRT-D, we selected CRT-D in our patient because of her repeated arrhythmias. The efficacy of CRT in the young and in those with congenital heart disease (CHD) has not yet been established because the vast majority of patients included in randomized clinical studies of CRT have cardiomyopathy of ischemic or idiopathic etiology and most patients are middle-aged and older adults. Although there are no prospective trial data, retrospective series show that CRT is similarly effective for managing asynchrony-associated heart failure in the younger population as it is for treating adults with ischemic and idiopathic dilated cardiomyopathy [11, 12]. And our case demonstrates that CRT is a useful adjunct in the treatment of heart failure in the young after the LV volume reduction surgery. In addition, CRT has been discussed as an alternative to cardiac transplantation in advanced heart failure. Bert Hansky et al. demonstrate that CRT is a reliable therapeutic option for the long-term treatment of end-stage heart failure and LV asynchrony . In many countries, cardiac transplantation is difficult because donors are particularly rare. This is one of the reasons why we elected to perform CRT. CRT also may become a bridge to transplant that offers extended patient longevity and improved quality of life to younger patients with CHD and end-stage heart failure . Our case demonstrates the merit of such a concept. We conclude that CRT is a useful adjunct in the treatment of heart failure in adolescents after the SAVE procedure. We propose that CRT is a promising modality for the treatment of refractory heart failure with asynchronous LV wall motion. Further studies are needed to determine the indication, effectiveness, and the long-term benefits of this therapy in the pediatric population. Written informed consent was obtained from this patient and her mother for publication of this case report and any accompanying images. A copy of the written consent is available for review by the Editor-in-Chief of this journal. TM is a graduate student and a pediatric cardiologist in charge in a pediatric ward of Kyoto university hospital. SB is an assistant professor and a pediatric cardiologist in charge in a pediatric ward of Kyoto university hospital. NY is a graduate student and a pediatric cardiologist in charge in a pediatric ward of Kyoto university hospital. SK is an assistant professor and a pediatric cardiologist in a pediatric ward of Kyoto university hospital. TD is an assistant professor and a cardiologist in charge in a cardiovascular ward of Kyoto university hospital. HD is an assistant professor and a pediatric cardiologist in charge in a pediatric ward and an outpatient clinic of Kyoto university hospital. TH is a professor of the pediatrics department in Kyoto university hospital. He is a supervisor of this manuscript. TM was an attending physician in the pediatric ward in Kyoto university hospital, and wrote most part of this manuscript. SB is an attending physician in the pediatric outpatient clinic in Kyoto university hospital, and gave most comments for this manuscript. NY is an attending physician in the pediatric ward in Kyoto university hospital. SK is an attending physician in the pediatric outpatient clinic in Kyoto university hospital. TD is an attending physician in the cardiovascular outpatient clinic in Kyoto university hospital. HD is an attending physician in the pediatric outpatient clinic in Kyoto university hospital. TH is a general supervisor of this manuscript.